Since a few years, I have been skating around some unusual people on Quebec city’s ice rinks, three of them have especially caught my attention, either they are gliding on the never-ending straight-aways of the 400 meters on Gaétan-Boucher oval or steering in the tight corners of the 111 meters inside rinks – all three of them are above 65 years of age. Curious, and I admit it, quite charmed, I started wondering about the particular challenges that would be brought by doing speed skating for such noble athletes. So I arranged to meet with Jules Lefebvre, 66, Gaétan Rochette, 69, and Yves Garneau, 75, to talk about speed skating and the search for excellence, but also to learn more about their motivations, their history, and the challenges they love to take up again and again. 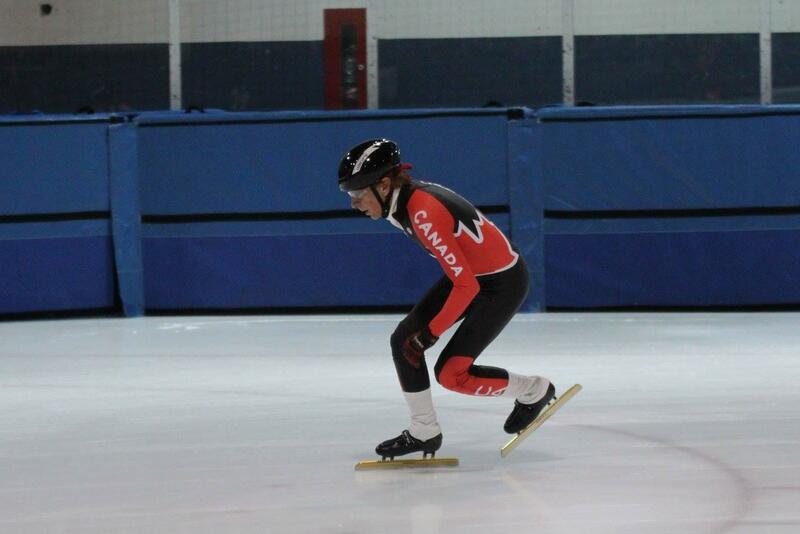 Jules Lefebvre started long track speed skating in 2012. 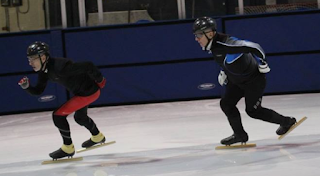 One of his friends from cycling, Gilles Champagne, who was involved in the Quebec City masters speed skating club (CPVQM), suggested he tried long track speed skating as a complementary activity for cycling during the long winter months. “Speed skating had always been on my mind. In my life, it had always interested me, but I did not think it was available to anybody,” he says. At first, speed skating was only a sport of secondary importance, however it quickly acquires an intrinsic value and becomes for Jules a sport to which he wants to commit fully. 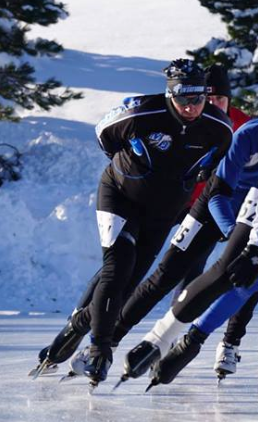 Jules is now always eager to skate long distances, and for that matter, he is sorry that the 50 km is not offered anymore as part of Quebec City’s marathon. Gaétan Rochette, who is a real pioneer on the speed skating scene in Quebec City, puts on speed skates for the first time in 1982. He then hops on the 400 meters to come along during his son’s training sessions on the outdoor oval. 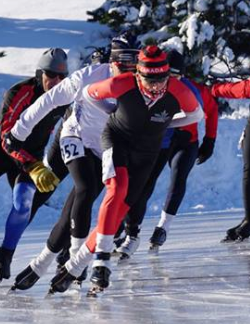 Gaétan’s journey on the ice witnesses the debuts of masters’ speed skating in Quebec City. In 1987, Pierre Gagné creates and coaches the Quebec's Master Club. “Pierre Gagné was my first coach. He told me: ‘Follow me and do what I do,’” laughs Gaétan. From then on, Gaétan gets involved in many speed skating organisations, such as the CPVMQ, the IMSSC (International Masters’ Speed Skating Committee), and the MSI (Marathon Skating International), in addition to taking part in numerous regional, provincial, national and international events and competitions. As for Yves Garneau, who wears speed slates for the first time at 59 years old, he is extraordinarily driven by competition. The thing that attracts him to this sport is the beauty of the long strides and elegance of the movements. He remembers vividly his first time on Gaétan-Boucher ice rink. Even though it was pouring rain, on evening in fall, Yves immediately falls in love with the sport, and goes to buy his first pair of clap skates a few days later. He has now won no less than 75 medals, and is motivated by competition and winning. He wants to be one of the best masters in the world and win medals in his category. His passion for marathons comes from the sensation of freedom he gets when skating on vast spreads of natural ice. For skaters that were up until then being hampered by the elements having to train on an outdoor rink, the appeal of short track is first and foremost regarding the predictable and consistent aspects of training conditions. Even when winters are mild, it can be tough on the outdoor ice rink in Sainte-Foy. Sometimes, snow and rain can be responsible for the temporary closing of the oval, and sometimes, gusty winds and freezing cold can dishearten many skaters to step on the ice. So before they joined the CREM-PVQ, a Quebec speed skating club created in 2014 dedicated especially to short track for seniors and masters, our three ice warriors were managing to skate indoors once a week with other masters in Saint-Étienne, on Quebec city’s south shore, to skate laps without any fuss, without a coach or training plan, and placing protection mats rather precariously. Yves is the first one to grasp the opportunity to train more seriously in short track, not hesitating to enrol in the CREM-PVQ on the club’s first day. The year after, he convinces his friend Gaétan to join in, followed by Jules in the beginning of this season. Their arrival in short track brings about a whole lot of unexpected new skills and knowledge they need to learn, which broadens their experience and stir their passion for speed skating. They encounter new challenges, such as controlling their speed, searching for stability, or taming their own fears. In short track, everything happens quickly, adrenaline is streaming, and a lot of skaters are moving real fast on a pretty limited surface. They had to learn new safety rules, manage a new space, learn how to take and give relays, how to pass, where to skate on the track, and refine their technique, because the tight turns on the 111 meters do not forgive a rough technique. In a short time, they realise that the new skills they are coming to grips with are transferable in long track speed skating. For Gaétan, who never really had a coach before, his short track experience brings him to substantially improve his basic technique. “I learned to skate with Pat [Patrick Bélanger, CREM-PVQ’s head coach]. 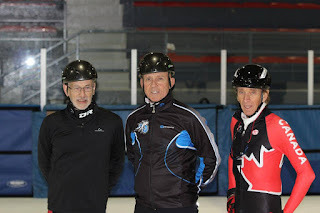 I’ve been skating for 35 years, and I learned to skate this year!” Besides all of that, these three buddies particularly enjoy the spirit of camaraderie that naturally prevails in short track. It was surprising to me that all three were eager to talk about their sports performance in relation to their age. Gaétan told me he had reached his peak in his early fifties. It was at that moment that he had the most fun and that he was able to get the most intensity from speed skating. Jules says he feels as though he was twenty years old as far as skills and attitude are concerned. However, if his physical abilities have been changing, the effort he puts in stays the same, and Jules continues to give everything he can on the ice, no matter what his capacities are. As for Yves, his performances have been consistent up until now. According to him, it is a little due to short track, partly because the season starts earlier. He admits that age has affected his agility, but says that short track has helped him improve his concentration, his technique and his endurance. And there is no doubt about it, this unusual trio really do carry out remarkable achievements! Depuis quelques années, je côtoie de véritables phénomènes sur les patinoires de la région de Québec. Que ce soit sur les interminables droits du 400 mètres de l’anneau de glace Gaétan-Boucher ou les virages serrés du 111 mètres des patinoires intérieures, trois d’entre eux ont particulièrement capté mon attention, du fait que ces mordus de vitesse sur glace ont tous les trois dépassé l’âge vénérable de 65 ans. Curieuse et, je l’avoue, charmée, j’ai voulu en apprendre davantage sur les particularités que comporte la pratique du patinage de vitesse chez de si augustes athlètes. J’ai donc rencontré Jules Lefebvre, 66 ans, Gaétan Rochette, 69 ans, et Yves Garneau, 75 ans, pour parler de patin et de dépassement de soi, mais aussi pour en connaître un peu plus sur leurs motivations, leur parcours et les défis qu’ils prennent plaisir à relever sans relâche. C’est en 2012 que le fougueux Jules Lefebvre s’initie au patinage de vitesse sur longue piste. 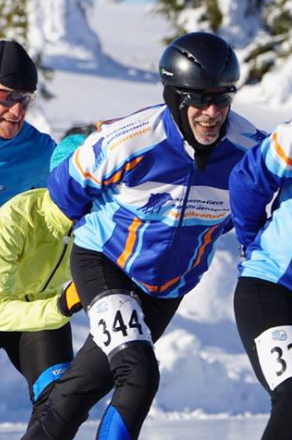 Son ami cycliste Gilles Champagne, un patineur très impliqué au sein du Club de patinage de vitesse des maîtres de Québec (CPVMQ), lui propose d’essayer le patin comme activité complémentaire au vélo pendant les longs mois de neige. « Le patinage de vitesse, c’était toujours dans ma tête. Dans ma vie, ça m’a toujours intéressé, mais je pensais que c’était inaccessible au grand public », confie-t-il. D’abord relégué au rang d’activité de second ordre, le patinage de vitesse acquiert bientôt une valeur intrinsèque et devient pour lui une discipline à laquelle se consacrer entièrement. Ainsi, Jules est toujours prêt à patiner des longues distances et déplore d’ailleurs que l’épreuve de 50 km ne figure plus au programme du marathon de Québec. De son côté, Gaétan Rochette, véritable pionnier du patinage de vitesse à Québec, grimpe sur des longues lames pour la première fois en 1982. Il saute d’abord sur le 400 mètres dans l’intention d’accompagner son fils lors d’entraînements sur l’anneau de glace. Le parcours de Gaétan révèle les premiers balbutiements du patinage de vitesse chez les maîtres dans la capitale. En 1987, Pierre Gagné fonde le Club des maîtres de Québec, où il fait office d’entraîneur. « Pierre Gagné a été mon premier coach. Il m’a dit : "Suis-moi et fais comme moi!" », s’amuse Gaétan, qui s’implique dès lors énormément dans les coulisses du patinage de vitesse, notamment au sein du CPVMQ, de l’IMSSC (regroupement international des maîtres en patinage de vitesse) et du MSI (Série internationale de marathon sur glace), en plus de participer à nombre de compétitions régionales, provinciales, nationales et internationales. Quant à Yves Garneau, animé d’un esprit de compétition hors du commun, il chausse des patins de vitesse pour la première fois à l’âge de 59 ans. Ce qui l’attire d’abord dans ce sport, c’est la beauté de la glisse et l’élégance du mouvement. Il se rappelle comme si c’était hier sa première expérience sur l’anneau de glace Gaétan-Boucher, un soir d’automne, sous une pluie torrentielle. Malgré tout, c’est le coup de foudre, et Yves ne pourra réprimer l’envie d’acheter des patins clap, quelques jours plus tard. Comptant aujourd’hui 75 médailles à son actif, il affirme être mû par le désir de compétitionner et de vaincre, de se hisser parmi les meilleurs maîtres au monde et de remporter des médailles dans sa catégorie. Son amour des marathons provient également de la sensation de liberté que les vastes étendues de glace naturelle suscitent en lui. Pour des patineurs jusque-là tenus à la merci des caprices de Dame Nature sur l’anneau de glace extérieur, l’attrait du courte piste réside d’abord dans la prévisibilité et la constance des conditions d’entraînement. Même lorsque les hivers sont cléments, les conditions peuvent être difficiles sur l’anneau de Sainte-Foy. Si la neige et la pluie peuvent carrément causer la fermeture temporaire de l’ovale, les vents cinglants et les froids cruels peuvent, quant à eux, décourager plus d’un patineur de s’y aventurer. Ainsi, avant de joindre les rangs du Club régional d’entraînement des Mustangs en patinage de vitesse de Québec (CREM-PVQ), un club fondé en 2014 se dédiant principalement au courte piste chez les séniors et les maîtres, nos trois diables se retrouvent une fois par semaine avec d’autres maîtres à l’aréna de Saint-Étienne, sur la rive sud de Québec, pour enfiler des tours à la bonne franquette, sans entraîneur ni plan d’entraînement, et en installant les matelas de protection plutôt rustiquement. Puis, c’est Yves qui saisit le premier l’occasion de s’entrainer plus sérieusement en courte piste, n’hésitant pas à s’inscrire avec les Mustangs dès la naissance du club. L’année suivante, il enrôle son ami Gaétan, qui est ensuite suivi de Jules, au début de la saison actuelle. Leur arrivée en courte piste entraîne un lot d’apprentissages inattendus qui enrichissent leur performance et attisent leur passion pour le patinage de vitesse. Ils se heurtent à de nouveaux défis, comme le contrôle de la vitesse, la recherche de stabilité ou l’apprivoisement de leurs craintes. En courte piste, tout se passe très rapidement, l’adrénaline fuse, et beaucoup de patineurs circulent en même temps sur une surface aux dimensions plutôt limitées. Il faut assimiler de nouvelles règles de sécurité, apprendre à gérer un nouvel espace, à faire des relais, à dépasser, à patiner suivant divers tracés, il faut affiner sa technique. Les virages serrés du 111 mètres ne pardonnent guère les écarts de manœuvres. En peu de temps, ils se rendent compte que les avantages considérables de tous ces apprentissages sont transposables sur longue piste. Pour Gaétan, qui n’avait jamais vraiment bénéficié de l’expertise d’un entraîneur, le courte piste l’amène à améliorer substantiellement sa technique de base : « j’ai appris à patiner avec Pat [Patrick Bélanger, entraîneur-chef au CREM-PVQ]. Ça fait 35 ans que je patine et j’ai appris à patiner cette année! » En outre, nos trois gaillards affectionnent particulièrement l’atmosphère de camaraderie qui règne inévitablement sur la patinoire en courte piste. À ma surprise, tous les trois sont impatients de parler de performance par rapport à l’âge. Gaétan me confie avoir atteint son pic dans la jeune cinquantaine. C’est à ce moment qu’il aura éprouvé le plus de plaisir et d’intensité dans le patinage de vitesse. Jules, lui, se sent comme à vingt ans en regard de ses habiletés et de son attitude face au sport, bien qu’il admette que ses prouesses sportives ont diminué. Cependant, si ses facultés physiques changent, l’effort qu’il fournit demeure constant, et Jules continue de toujours donner le meilleur de lui-même, peu importe ses capacités. Quant à Yves, ses performances se maintiennent depuis ses débuts jusqu’à maintenant. Selon lui, c’est un peu grâce au courte piste, en partie parce que la saison débute plus tôt. Il admet que l’âge a influencé son agilité, mais ajoute que le courte piste a contribué à améliorer sa concentration, sa maîtrise de la technique et ses capacités physiques à l’effort. Dans leur entourage, l’intensité et la fréquence de leur activité sportive surprennent. Comme les groupes de maîtres ne bénéficient pas de subventions sportives ni de tarifs réduits, Jules, Yves et Gaétan doivent se lever aussi tôt que 5 h 30 pour aller patiner à l’aréna. Et pendant que beaucoup de gens de leur âge « restent assis dans des chaises berçantes à faire des mots croisés », eux font du patinage de vitesse sur courte piste et sur longue piste, et des marathons de glace. « Pour nous, c’est normal d’aller patiner 25 km un matin, c’est notre mode de vie. Mais quand tu parles à monsieur et madame Tout-le-monde, on n’est pas normal! », s’amuse Jules. Cependant, il ajoute avec candeur que « c’est le fun, des fois, faire des choses un peu extraordinaires ». Cela va sans dire, ces trois phénomènes accomplissent réellement des exploits formidables!